Today, ArcGIS is more than a software product. It is a platform that takes advantage of organizations’ huge information inventories. Platforms have changed the way society shares information, communicates, and collaborates. From Amazon to Apple, a variety of platforms on our devices remember who we are and call up the information we need to get the most out of our time. We move seamlessly from desktops, web browsers, tablets, and smartphones. Wouldn’t it be great if our professional platforms worked so smoothly? As the industry standard in GIS, the ArcGIS platform gives you a three-part information system that transforms your data into actionable intelligence. The portal is the hardware and software that connects your people, so they can obtain the geographic information they need. This is where internal information and third-party data resides. Everyone in your organization can access this information from desktop, web, and mobile devices. This three-part structure makes it easy to collect and communicate critical information to and from everyone in your organization, from your mobile workforce to executives in the board room and external stakeholders beyond. Keep reading to learn how to get the most out of your spatial platform. You’re five steps away from success. Most organizations still view GIS as a traditional client/server application. This means they implement ArcGIS for Desktop and ArcGIS for Server. Sharing is possible but more difficult. They implement nearly all spatialized applications within ArcGIS for Desktop or as custom web apps via ArcGIS for Server. They then build out their data model schema to be all inclusive. The data model becomes more and more complex while support becomes more difficult. 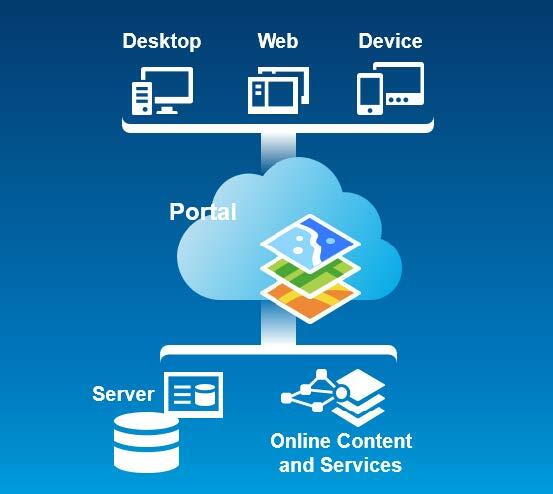 To begin implementing the platform, set up your portal, either ArcGIS Online or Portal for ArcGIS or a hybrid, and then create your organizations and groups. Give your colleagues access and permissions to these, and the portal is ready to go. You can publish your data to the portal as an Esri web map even without deploying the latest technology. The web maps enable you to share, collaborate, and communicate your data to anyone—on any device, anywhere. Web maps point back to your authoritative data. You can embed them directly into your website via the ArcGIS platform, making it easy to get your organization’s authoritative data to the right people in the company. Editing data takes place as it did before the platform; there is no change. It just works with the platform now. See how easy it was for Seneca Resources to implement the platform in this four-minute video. Because it’s critical to keep current, upgrade to the latest version of ArcGIS for Desktop, which focuses on your workflows. This version directly addresses what users and partners identified they needed out of ArcGIS for Desktop. For instance for utilities, ArcGIS 10.2.1 for Desktop includes updates for reconcile and conflict management, the geometric network, and replication. Esri developers therefore recommend utility and telecommunication users keep using ArcGIS 10.2.1 for Desktop as they continue to build patches for this release. In addition, they recommend users keep current with other Esri products, including ArcGIS for Server. The best way to begin leveraging your platform is to download Esri’s organizational models from the ArcGIS Resources site. This helps you understand how to take advantage of the focused solutions Esri offers. Esri Solutions for Gas Utilities website. The Esri solutions site has numerous template maps and apps available for addressing the common issues facing today’s industries. The ArcGIS for Gas Utilities site, for instance, shows solutions for emergency response, regulatory compliance, and leak surveying. And Esri adds to these workflows each month. 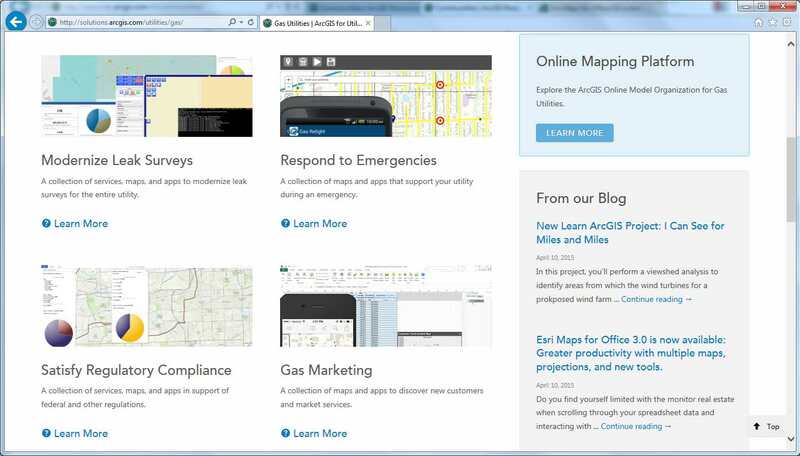 Visit solutions.arcgis.com to obtain best practices. ArcGIS Pro is Esri’s latest addition to the platform. It is a standalone desktop application that runs alongside ArcGIS for Desktop. Organizations can use ArcGIS Pro for 2D and 3D mapping, creating projects and tasks, performing spatial analysis with simple wizards, and generating web maps. Learn how to go ArcGIS Pro. Sensors are increasing rapidly, enabled by the Internet. The ArcGIS platform brings all your real-time data into maps, providing an intuitive approach to understanding your organization in real time. You can show critical live data, such as in the case of utilities, real-time crew locations, advanced metering infrastructure (AMI) customer data, and SCADA and distribution management system (DMS) feeds—all on a map. You do it by using Esri’s ArcGIS GeoEvent Extension for Server. Best of all, you can access this map from any device. Learn more about what ArcGIS GeoEvent Extension for Server can do for you. Benefit today from the platform by making sure your systems are upgraded. Explore preconfigured Esri maps, apps, and templates. Go pro with ArcGIS Pro and extensions including ArcGIS GeoEvent Extension for Server, so you can get the most out of the latest technology, including 3D mapping and real-time data integration. You’re already a pro. Make sure your whole organization can be, too.